Garbiñe Muguruza and Carla Suárez will be at the disposal of the Spanish Federation Cup captain, Anabel Medina, for the playoff on April 20 and 21. 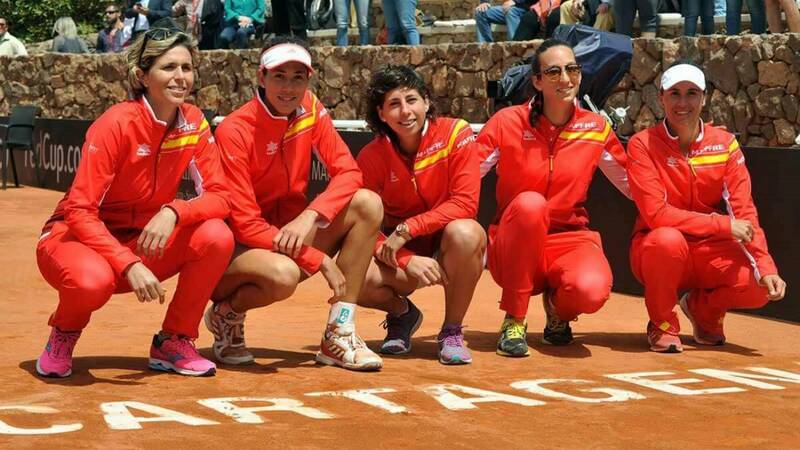 Garbiñe Muguruza and Carla Suárez will play again with España in Copa Federación, as you may have known As. After his absence in the first round of the Grupo Mundial II, in which the Selección won to Japón by 3-2 with an outstanding performance of Georgina García Pérez, the two national players better classified in the ranking WTA (19th and 27th, respectively) will be available again to the captain, Anabel Medina, to try to return the team to the highest category in the playoff of promotion against Belgium to be played at Cortrique next week, on April 20 and 21. España will have, therefore, the best possible team to try to win the Belgian team that has Elise Mertens (17th), Alison Van Uytvanck (52nd) and Kirsten Flipkens (55th) as best players. The matches will be played indoors, at Lange Munte of Cortrique, and on hard court. Medina will have to choose three other components, with a foreseeable place for the best Spanish doubles player, María José Martínez (19th in the world). Those elections will come from a bunch of tennis players that make up Sara Sorribes, Lara Arruabarrena, Georgina García, Silvia Soler and Aliona Bolsova (Paula Badosa has been injured this Monday). After winning the title at Monterrey, Muguruza is training at home, at Ginebra, this week, and Carla Suárez competes at Lugano (this Tuesday plays against Hercog) . The next Thursday, at 12:30 at the CSD, will be announced officially the team that will compete against Belgium for the eighth time in the history of the Fed Cup with a balance of 4-3 for Spain. The last series was played in 2004, in the quarterfinals, on the sand of Club Nazaret de Xerez and Anabel Medina was protagonist as a player with two important victories in singles against Els Calens and in doubles, together with Vivi Ruano, before the own Callens and Kirsten Flipkens, who had won before Valencia. The other point was achieved by María Antonia Sánchez Lorenzo in front of Flipkens.